This is a life-changing retreat for your body, mind, and spirit! Join their upcoming retreat or see them on tour this fall. Details on event page. My new album, Speak, is out! It’s available for pre-order by clicking here or on the album cover below. Downloads will be available on the official release date of November 1st! Replete with catchy hooks and conscious lyrics, SPEAK is a lighthearted yet probing parade of social and spiritual commentary, world pop rhythms, and spoken word that will keep you entertained, from the first note to the last. Contemporary and world grooves, mixed with elements of rock, blues, jazz and pop, make the album infectious and upbeat. World-class singers C.C. White, Gaura Vani, and Benjy Wertheimer add extra soul to the songs. On SPEAK, I make social, economic, political, and spiritual statements that swim against the tide of the us-versus-them mentality that has dominated our national dialogue this year. Yet, the album isn’t heavy—it’s uplifting and inspirational. These songs are born from a love of musical diversity, movement, poetry and spoken word. We are living in a world that often draws us away from community and the vital remembrance of who we truly are. These songs are meant to rattle our cages and ask us to question some of our deepest assumptions while at the same being musically groovy and uplifting. Join Katie O’Connell and myself for our second week Panchakarma Retreat in India. This is a life-changing retreat for your body, mind, and spirit! In our very chaotic and busy world full of what feels like unstoppable stress, this retreat is a true miracle. Taking three weeks for yourself is an act of self-love and kindness. This healing retreat is in the mountains of southern India at a beautiful center where it is cool at night and warm during the day. Here you can unwind and jump start into a whole new level of health and well-being. You will also have regular Ayurvedic consultations with the retreat’s on-site world class physician and pharmacist, two daily Ayurvedic treatments, delicious meals, and cleansing practices specific to your needs are all facets of this retreat, which will leave you feeling clear, vibrant, and deeply rejuvenated. 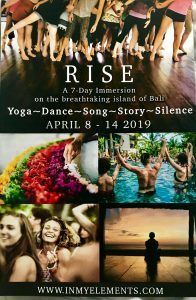 This retreat also includes daily yoga classes with Katie, Drumstory events with John, presentations on Ayurveda, Kirtans, and lots of free time to walk into the Indian countryside that borders the retreat, investigate the town, or visit local attractions including a safari. Ayurvedic treatments like this are wonderful for helping deeply calm the nervous system and greatly decrease stress as well as treat a myriad of health concerns like anxiety, headaches, insomnia, high blood pressure, diabetes, psoriasis, digestive issues, heart disease, and more. For registration information and pricing visit www.dragonflyogabarn.com. Ayurveda means “Science of Life.” The focus of Ayurveda is on long-lasting holistic health, not just a short-term cure. It offers a unique blend of science and philosophy that balances the physical, mental, emotional, and spiritual components necessary for long term wellness. A time-tested, ancient system of disease prevention and healthcare, Ayurveda is a complete system of natural medicine and has been a way of life for millions of people across the planet. In Ayurveda, specific therapies are developed for each individual as opposed to a generic cure commonly prescribed by modern medicine. Ayurveda addresses disease from the root cause and provides a permanent cure instead of a quick fix. Pancha means “five” and Karma means “to cleanse” and so Panchakarma is the ultimate healing experience for detoxifying the body and mind, strengthening the immune system, and restoring balance and well being. It is a deeply powerful yet gentle cleansing process that utilizes deep rest, herbs, body treatments, enemas, steam baths, diet, and specific treatments catered to an individual’s unique constitution and health concerns. This extended retreat allows each participant adequate time to release deeply held toxins and blocks that adverse affect the mind and body, allowing the opportunity to reorganize and heal on a profound level. “PK” is effective for treating a variety of health concerns and imbalances, including but not limited to: stress, anxiety and depression, migraines, arthritis, digestive issues, hypertension, chronic fatigue, joint pain, obesity, diabetes, back pain, ulcers, IBS, muscle and tendon disorders, skin disorders, respiratory diseases, urinary and bowel diseases, chronic constipation, sinusitis, insomnia, addictions, infertility, reversed hearing loss, eating disorders, and more. This idyllic Ayurvedic center is located in the mountains of western Tamil Nadu, close to Kerala is one of the prettiest parts of India. 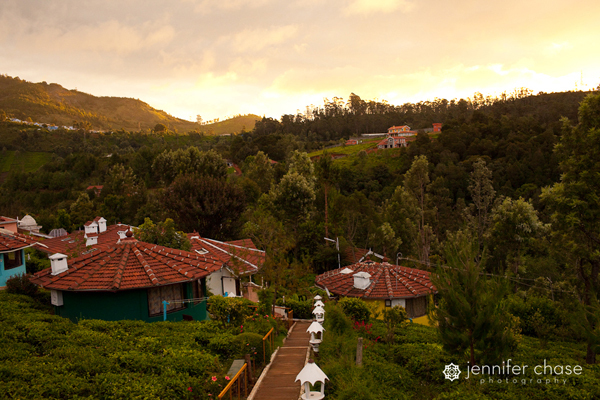 Nestled amidst a lush 10-acre green tea plantation, healing eucalyptus forests, nearby waterfalls, and surrounded by the pure Nilgiri Mountain air, the retreat is in the perfect environment for rejuvenation. Away from the hustle of the city and surrounded in natural beauty, expect a profound transformation to take place! Every meal is made fresh with the retreat’s own source of pure mineral water and organic vegetables and herbs. With world-class Ayurvedic physicians and panchakarma therapists, and an amazing staff of chefs and gardeners, this peaceful retreat center combines modern comforts with the best of ancient medicine and a beautiful setting you will come to call home. Should you want to venture out for day trips, there are also many optional excursions to personalize your once in a lifetime experience in India, including the markets of Coonoor City, a train ride through the mountains to the town of Ooty, and even a day trip to an elephant reservation, not to mention endless walking and hiking just steps out of the retreat! 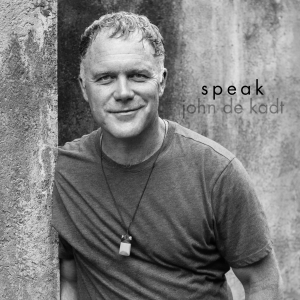 John de Kadt is a percussionist, poet, and storyteller. He has played ethnic hand percussive instruments for over 30 years and plays drums from across the globe. He has performed around the world, taught drumming on PBS and live nationally on NBC, and has performed with Krishna Das, David Darling, Subash Chandra, Ganesh Kumar, Jai Uttal, Robert Bly, Baba Olantunji, Colman Barks, and many others including being a founding member of Internationally acclaimed group, The Hanumen. John has released five CDs and travels world wide performing his unique and powerful blend of poetry, story, and percussion. Before doing music full time, John was an acupuncturist, herbalist, and Ayurvedic consultant for 15 years. He loves and still practices many aspects of these holistic medicines. Katie O’Connell has been practicing yoga for almost 20 years and is an Ayurvedic Health Practitioner and Ayurvedic Yoga Therapist. 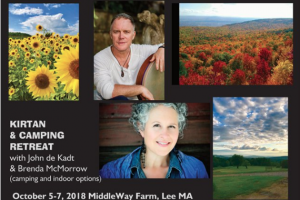 Katie owns her own retreat center, Dragonfly Yoga Barn, in the beautiful White Mountains of NH with her husband of 24 years, where they facilitate retreats and events of all kinds. Katie is a singer, poet, mother, gardener, and life-long student of Nature. She has over 700 hours of yoga study with Paula Tursi, Sudha Lundeen (Kripalu), Cora Wen, Sadie Nardini, and many others, and nearly 1,000 hours in the study of Ayurveda with Dr. Paul Dugliss (New World Ayurveda) and Dr. Marc Halpern (California College of Ayurveda) as well as certifications in Thai Yoga, Yoga Nidra, Restorative Yoga, Reiki, and more. Katie runs international retreats, teaches daily yoga classes, provides education in Ayurveda and yoga, offers Ayurveda consultations, private yoga therapy, Thai bodywork, and yoga coaching at Dragonfly. Her greatest teachers of all are her students, her children, and her husband and parter in everything, Declan. Two and Three Week Options! This retreat is a true blessing. In our very chaotic and busy world with what often feels like its unstoppable stresses, taking three weeks for yourself is a true act of self-kindness. It will allow you to unwind and jump start into a whole new level of health and well-being. Panchakarma is the ultimate mind-body healing experience for detoxifying the body, strengthening the immune system, and restoring balance and well-being. It is a deeply powerful yet gentle cleansing process that utilizes deep rest, herbs, body treatments, enemas, steam baths, diet, and specific treatments all catered to the individual’s unique constitution and health concerns. The extended 2-3 week retreat allows our body to release deeply held toxins and blocks that adversely affect our mind and body, giving ourselves new opportunity to reorganize and heal on a profound level. This will be a life changing retreat for your body, mind, and spirit. You will have ongoing Ayurvedic consultation with on-site Ayurvedic doctors, meals to support your treatment plan, and cleansing practices specific to your needs are all facets of this retreat, which will leave you feeling clear, vibrant, and deeply healed. 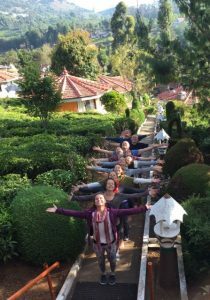 Your group leaders have designed a retreat experience that includes daily yoga classes with Katie, storytelling and drumming with John, Ayurveda presentations, and lots of free time to walk into the Indian countryside that borders the retreat, investigate the town, or visit local attractions. Nestled beside a lush green tea plantation, eucalyptus forest, nearby waterfalls, and surrounded by the pure Nilgiri Mountain air is what makes the retreat center so special; away from the hustle of the city and surrounded in natural beauty, expect a profound transformation to take place! 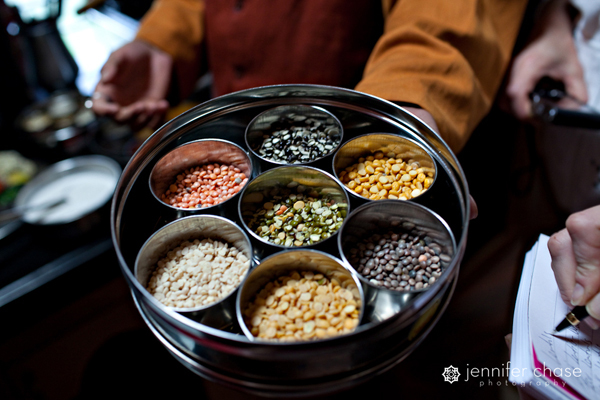 There are also many optional excursions to personalize your once in a lifetime trip to India! Feel free to email Katie and John if you are interested in this very special retreat! Space will be limited, and you won’t believe the great rates!! Basic single rooms begin at only $1,819.00 for Mini-Panchakarma (2 weeks) and $2,729.00 for Maha-Panchakarma. Deluxe rooms are available at very reasonable additional rates There are two components of the registration process; first contact either Katie or John so that we can send you our registration form and get to know you a little better! You can reach John at [email protected] or Katie at [email protected]gmail.com for more detailed info. We will then prompt you to register for the retreat with Vandana, the retreat representative who will work with you to choose a room and either the Mini or Maha Panchakarma option. Katie is working with a travel agent who will offer special rates to all who book via Katie, so please inquire about this opportunity. We are excited to share this amazing journey with you!!! Please note, dates on the brochure will be updated on next printing. My new music video The Village is live on Youtube.